No Rock 'Em Sock 'Em Here: Behold A U.S. Vs. Japan Giant Robot Duel Engineers Gui Cavalcanti and Matt Oehrlein have brought science fiction to life. Their giant robot Eagle Prime fights a giant Japanese robot in an epic battle airing on Twitch on Tuesday. 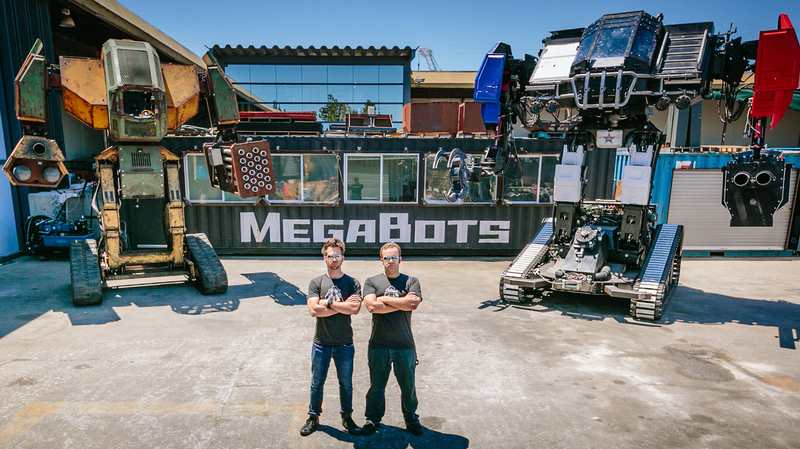 Matt Oehrlein and Gui Cavalcanti, co-founders of the robotics company, MegaBots, with giant robots MK2 (left) and Eagle Prime. Two years ago an American robotics company challenged a Japanese robotics company to a duel. Their weapons of choice? Giant robots. 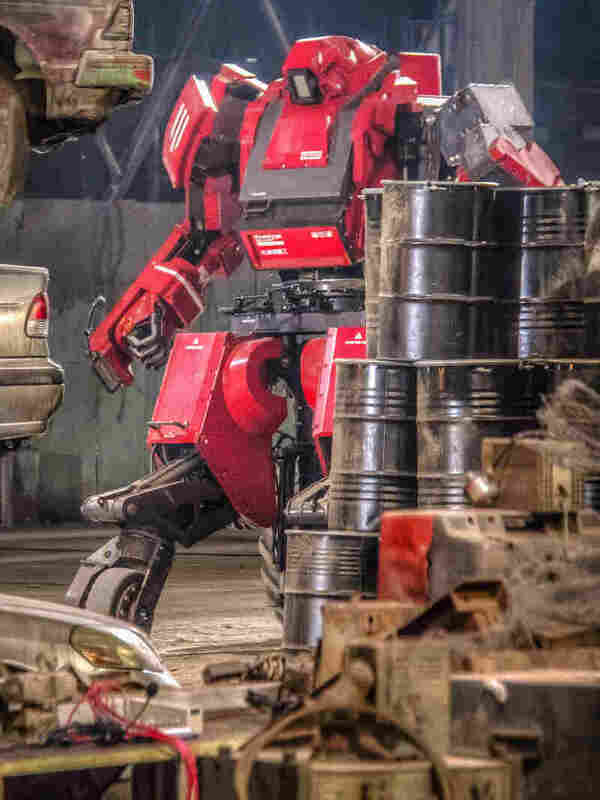 This long-awaited match between the monstrous robots — built by MegaBots Inc. of the U.S. and by Suidobashi Heavy Industry of Japan — will be broadcast on Tuesday via the online steaming site, Twitch. It's billed as the "first ever giant robot fight." "This is a personal dream of mine come to life," says engineer Gui Cavalcanti, MegaBots' co-founder. Cavalcanti tells Morning Edition host Rachel Martin that it was both "awesome" and "terrifying" to co-pilot the 16-foot-tall, 12-ton robot – named Eagle Prime – during the duel. Cavalcanti, and his co-pilot Matt Oehrlein, were actually inside the robot controlling where the robot went, what its legs and arms did, and deploying its weapons. Kuratas prepares for the first fight of the giant robot duel. "We're sitting on top of 430 horsepower Corvette engine," Cavalcanti says. "You can actually feel the robot just kind of shaking and quaking around you as you get punched, as you lean into a turn, as you fire the weapons or throw a punch." Eagle Prime can be outfitted with a range of weapons from cannons to a chain saw, Cavalcanti says. Its challenger, Kuratas, stands about 13-feet tall and weighs about 6.5 tons. Though the duel was pre-taped in an abandoned steel mill in Japan back in September, NPR does not know who won. We do know that there will be multiple rounds of fighting and the winner will be decided when one robot becomes incapacitated. But this is about more than just a giant robot fight and a battle for technological superiority. Cavalcanti says their goal is to form a new giant robot sports league and turn it into the next arena and stadium sport. "So instead of going to watch boxing at an arena, you go to watch giant robots fight and you feel like you're living in the 21st century. Technology has caught up with the dream," he says. In turn, Cavalcanti says, he hopes seeing giant robots fight and compete will inspire kids to become engineers and scientists.